Hello all, I am new to this forum and glad to be a part of it. 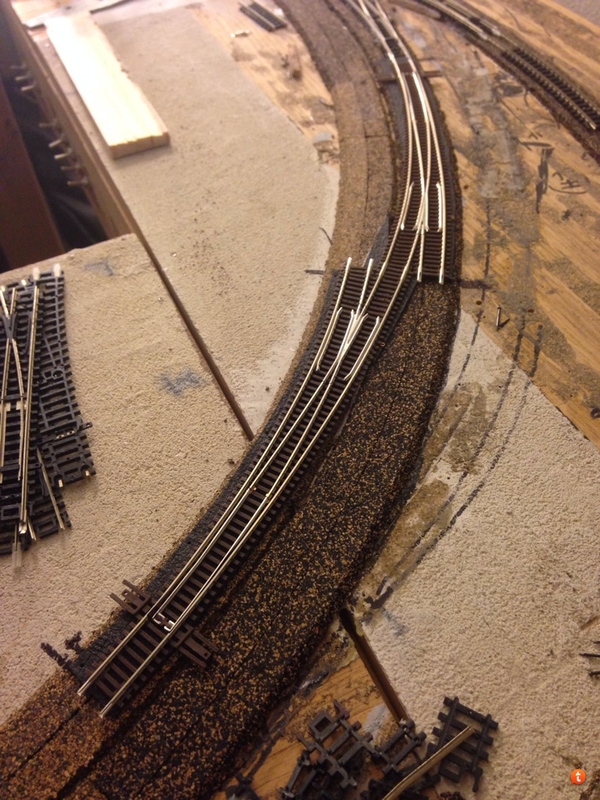 I am looking forward to learning from others and picking up great tools/tips to incorporate into my layout as it takes shape. 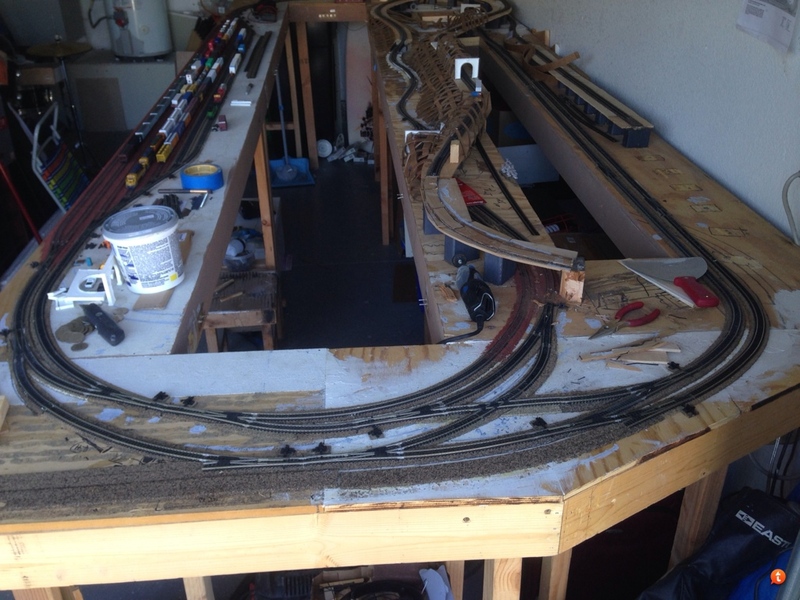 This is technically my first layout, I started this layout several years ago as a project for my son and I and really haven't had too much success with getting it running due to being in the military and having to tear down due to moving/deploying! 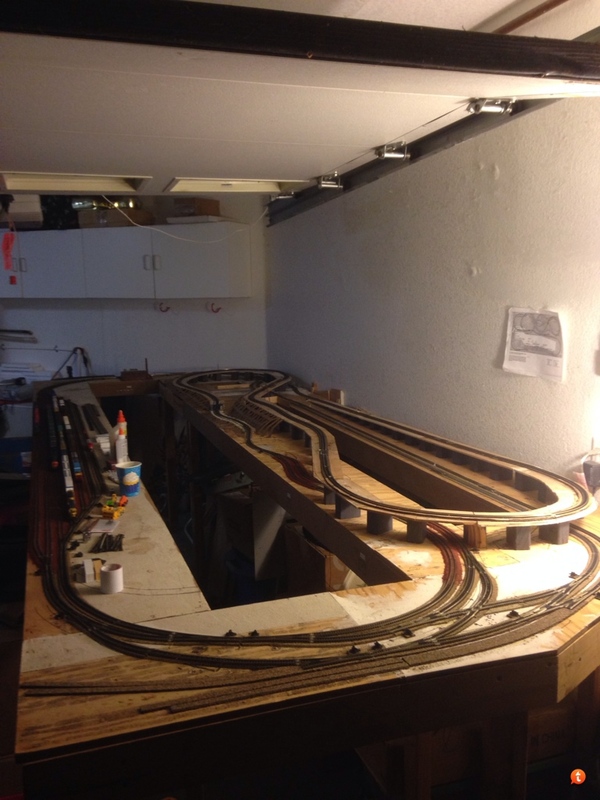 I have finally been able to start making some progress with it this last year and I thought I would share now for feedback and just to track progress of the layout. 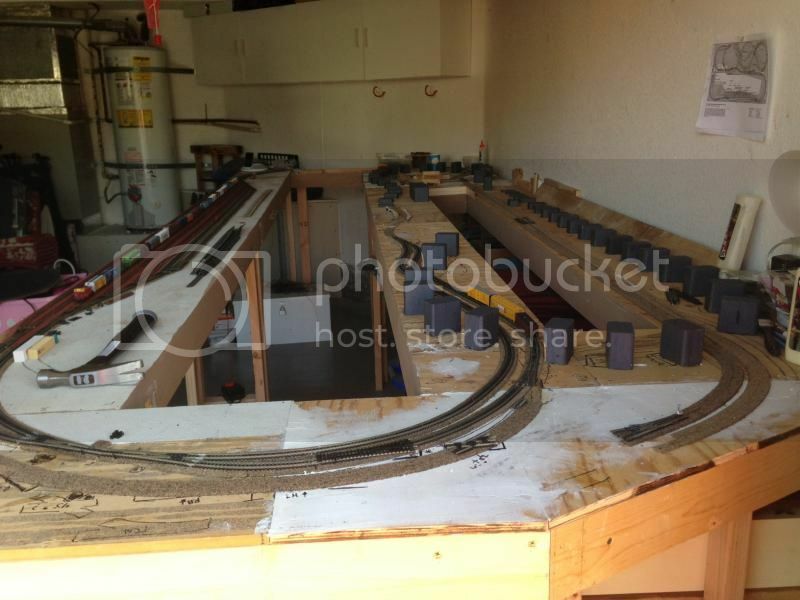 The layout is being modeled after BNSF Southern California operations during the BN/ATSF merger era. 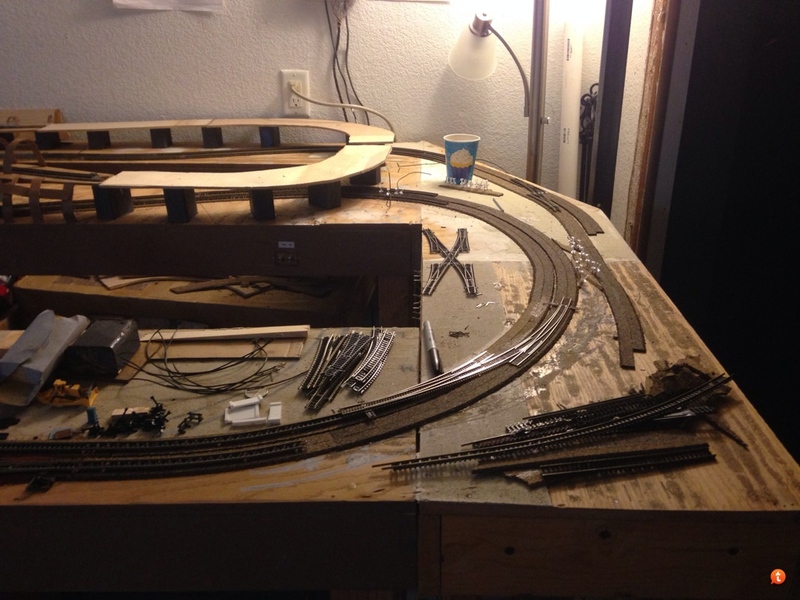 The layout finally has running trains and switches that work and I still have some wiring to do for the yard. 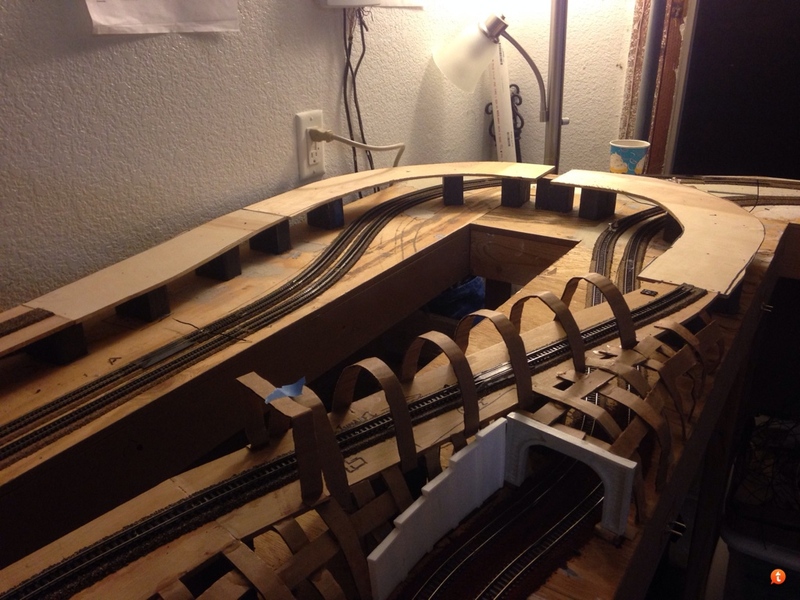 This is the first section of what will eventually have a larger yard and another city/industrial section that are not built at this time. 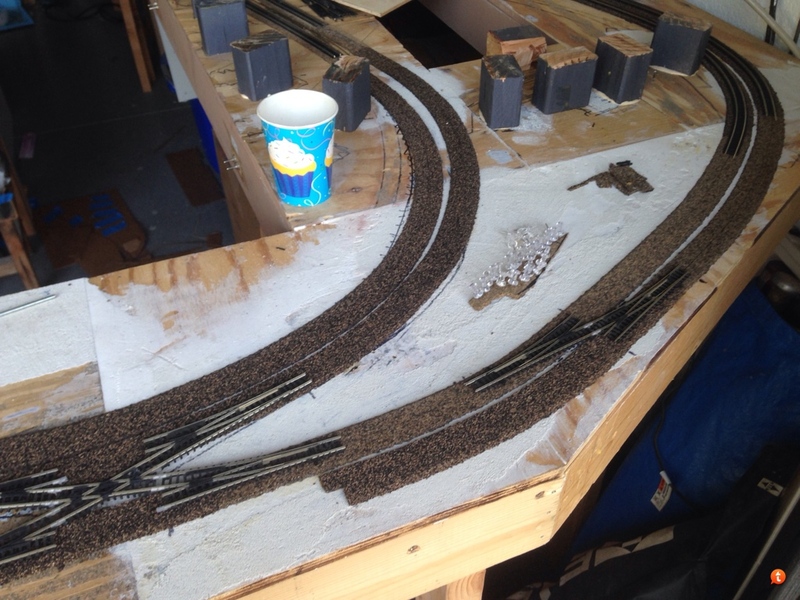 I haven't started any scenery yet other than playing around with ballasting some tracks and prepping some hills for "plastering". Hop on and enjoy, feedback and comments are welcome! 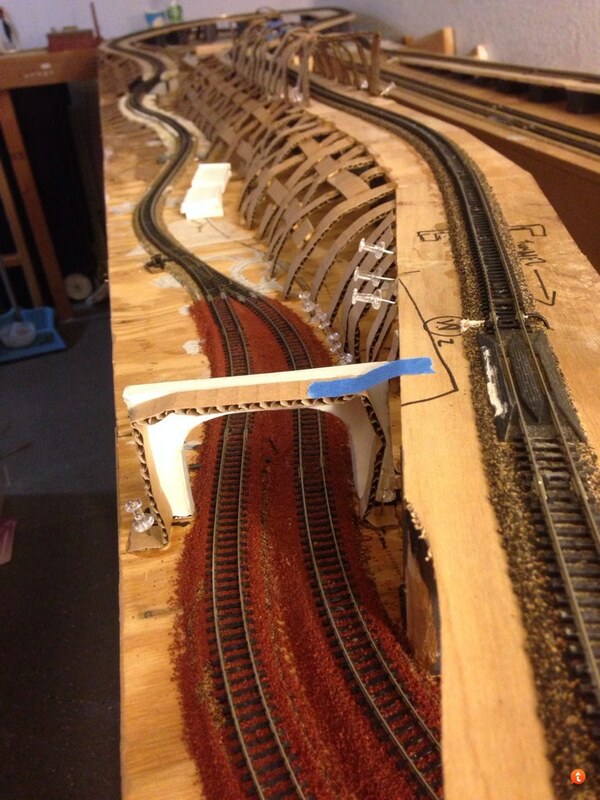 - Completed track on west end and installing base material for elevated track through mountains. 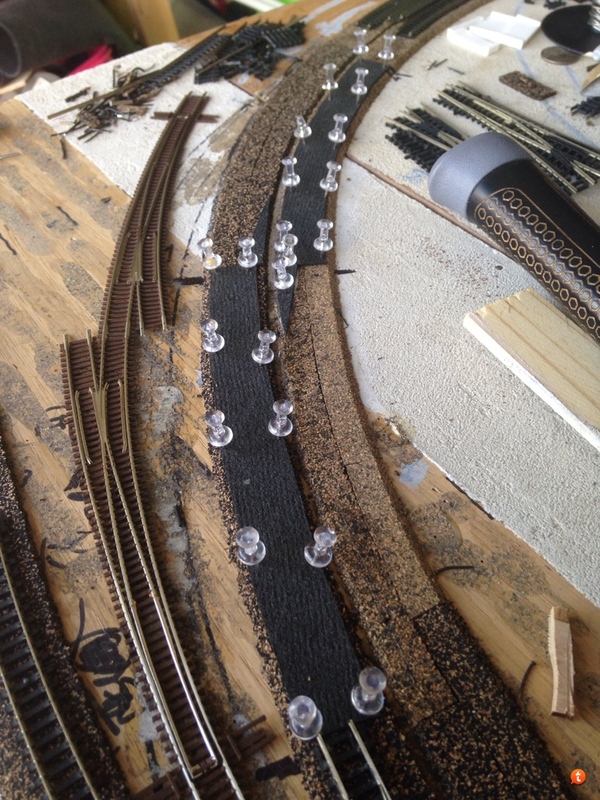 - Elevated track complete and operation, but still have some bugs to work out (I'll post some videos shortly). 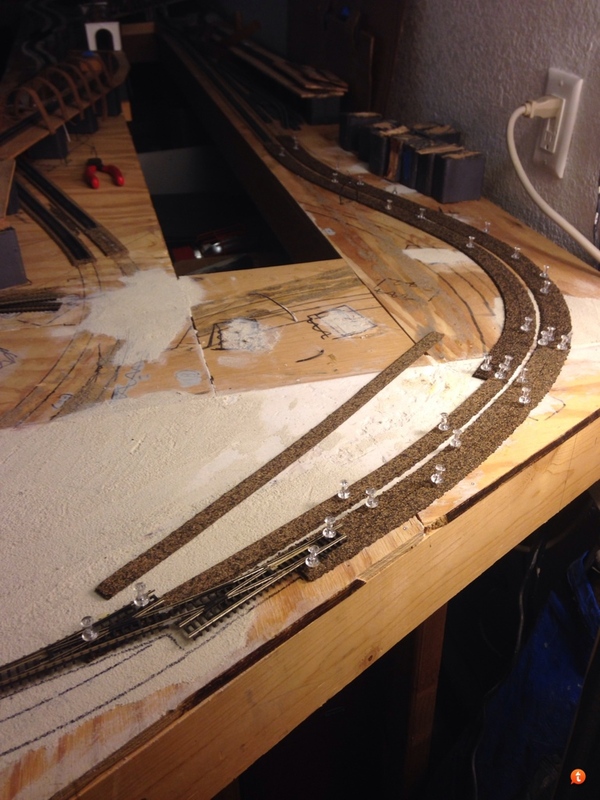 Starting to play around with building up hillsides for plastering and creating scenery for the mountains. 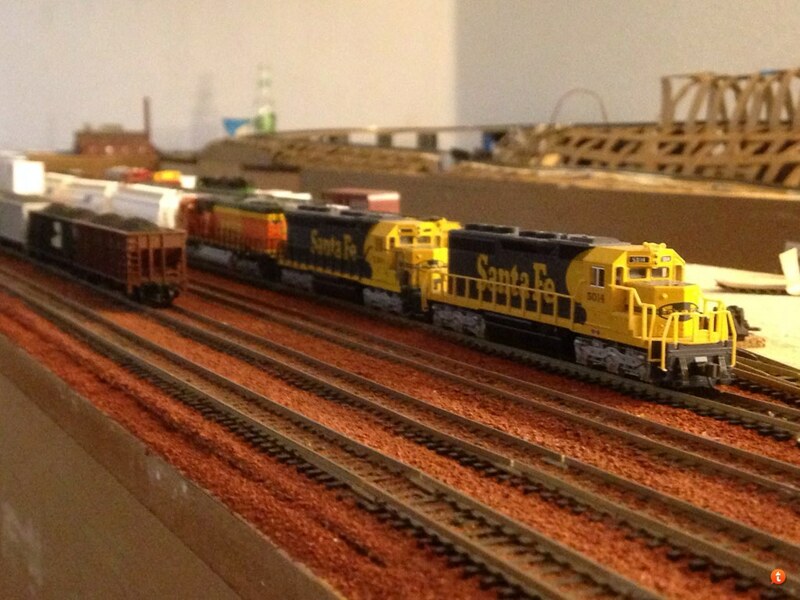 That's it for now, I'll try to post some videos too of train operations. Still got a lot of work to do! I was trying to upload a couple videos via taptalk but it won't let me so I guess I'll have to do so via photobucket or YouTube tomorrow. Steve, are those pillars made from 2x4's or something else? They are actually sections of 1x2 wood I painted, cut and tapered the tops to allow for the incline/decline of the track. 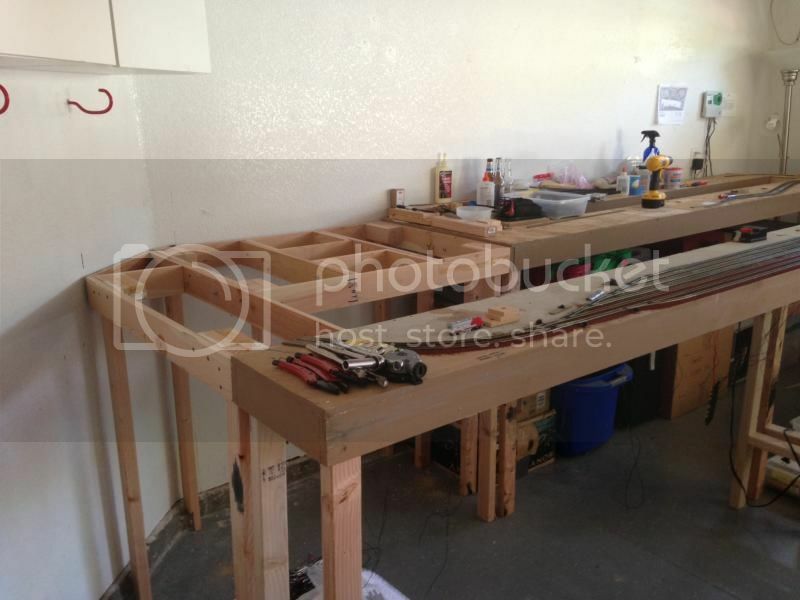 Probably not the most commonly used method of benchwork! 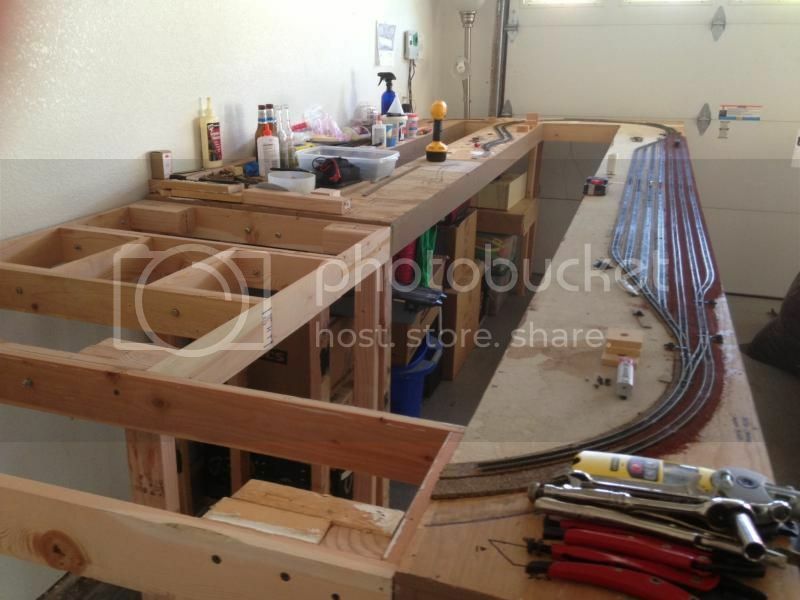 Great progress, great pictures. 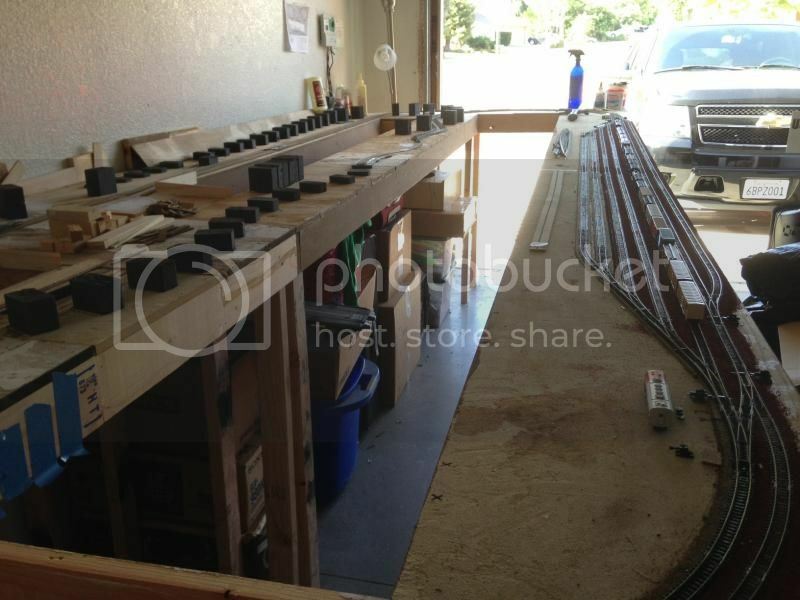 I envy your climate, viewing out your garage door. The average temp for the winter where I live has been 3.7 degrees f. Of course, don't even mention the words wind chill or polar vortex. 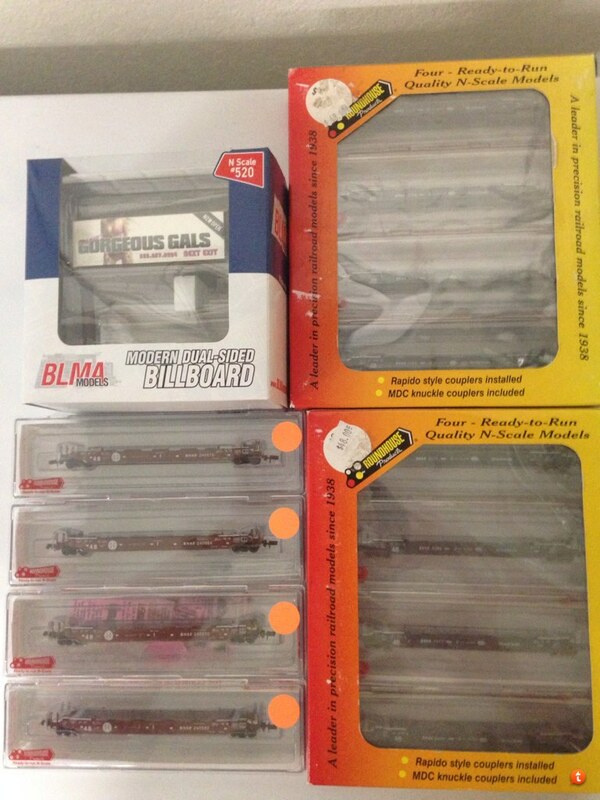 Thanks for posting your stuff. 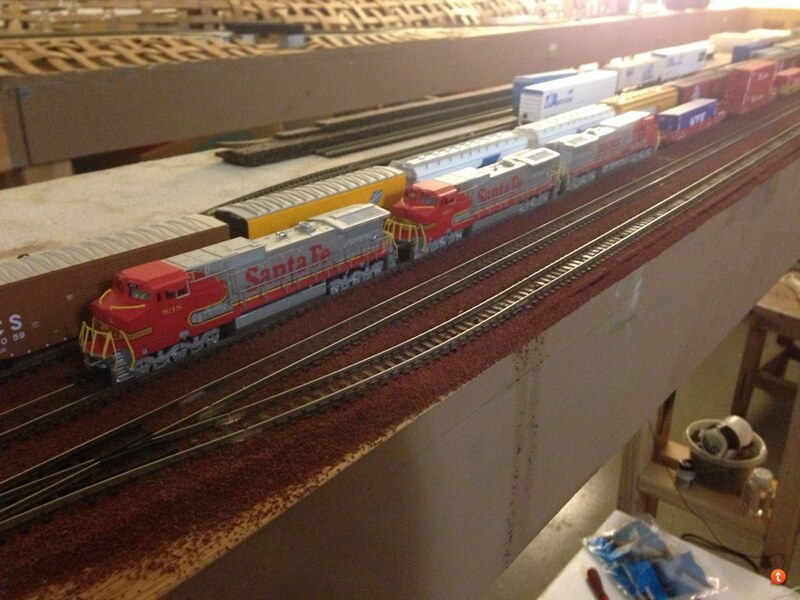 Makes me like N scale. Thanks, the weather here comes with a price - utilities! We just got 5.5 inches of rain over three days and are still nowhere near where we need to be for the year. Didn't even make a dent in the drought CA is experiencing. Looks great Steve! I wish mine was as far along as yours. 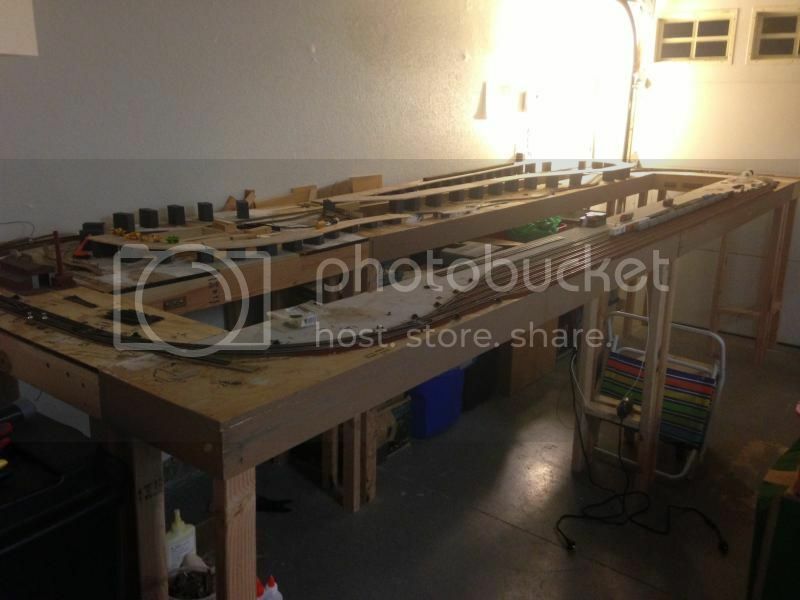 I am still working on the room, but with work and honey-do projects it's a very slow process. 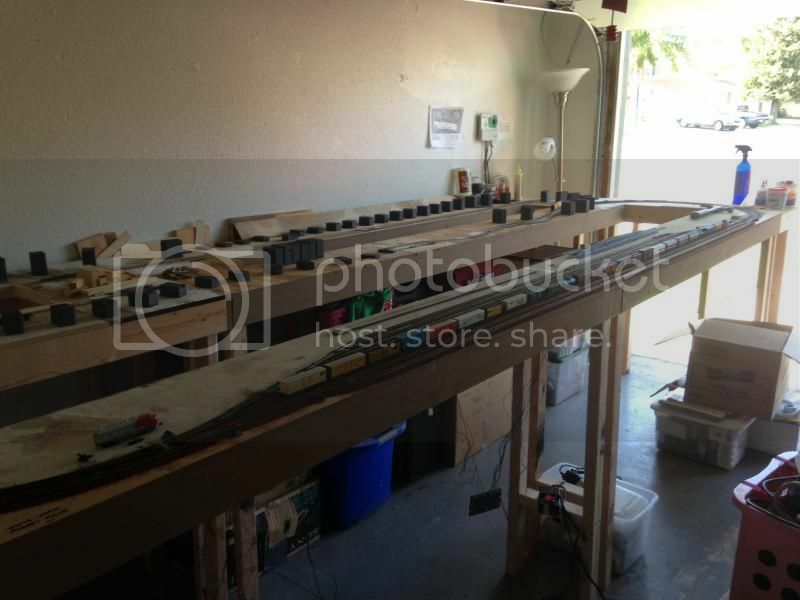 Thanks, I set it up in the garage for now but I'm hoping to have a dedicated room or basement for it at my next place. 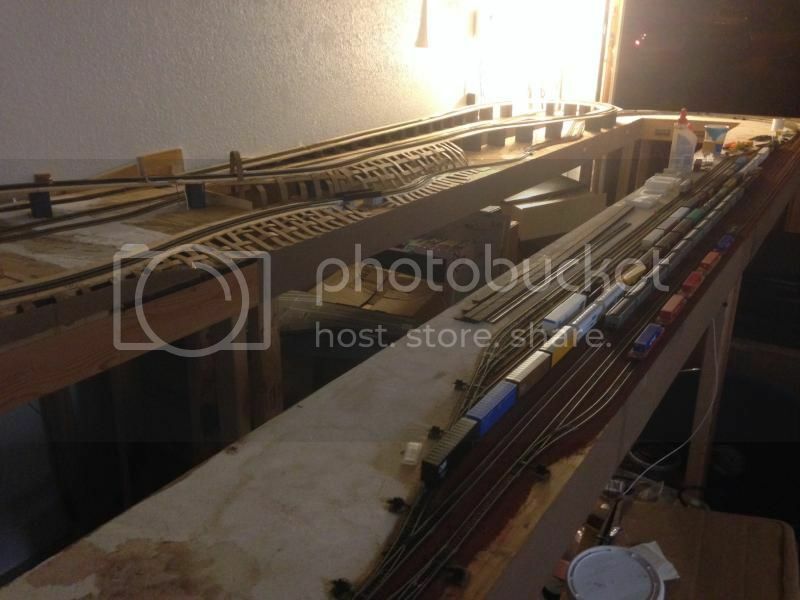 I need to make some backdrops to hide those ugly garage walls, add some nice wood to finish the sides of the benchwork - Facia I believe it's called?? Very true about it being a very slow process! Looks pretty good to me. 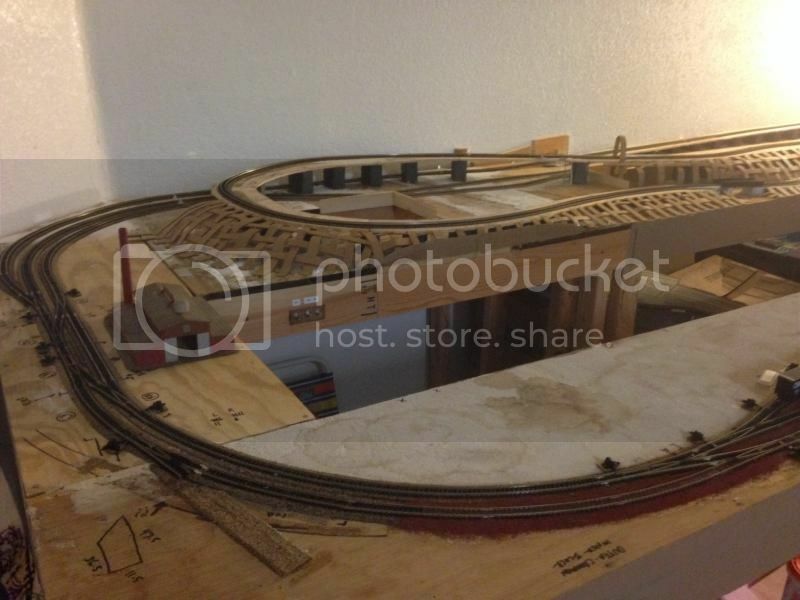 Can't wait to see it finished. 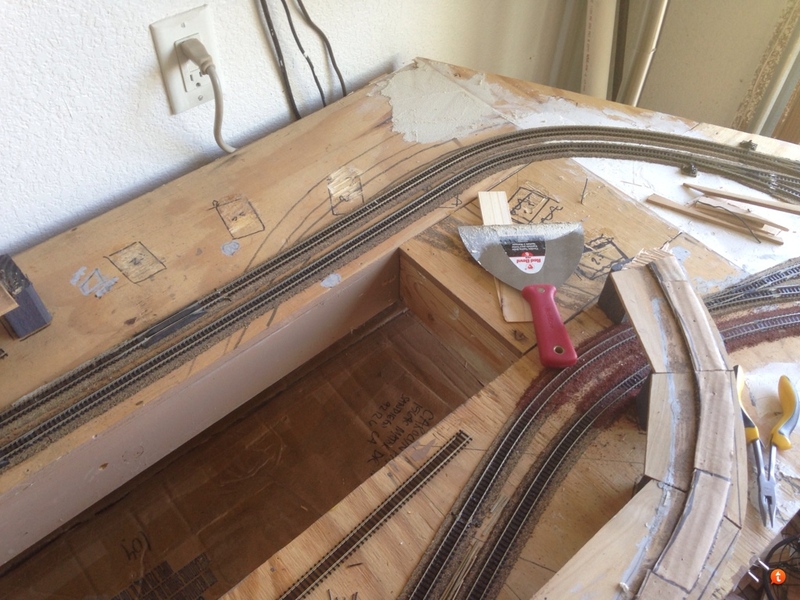 Thanks, I started pulling some track and the mountain supports this weekend on one end of the layout. 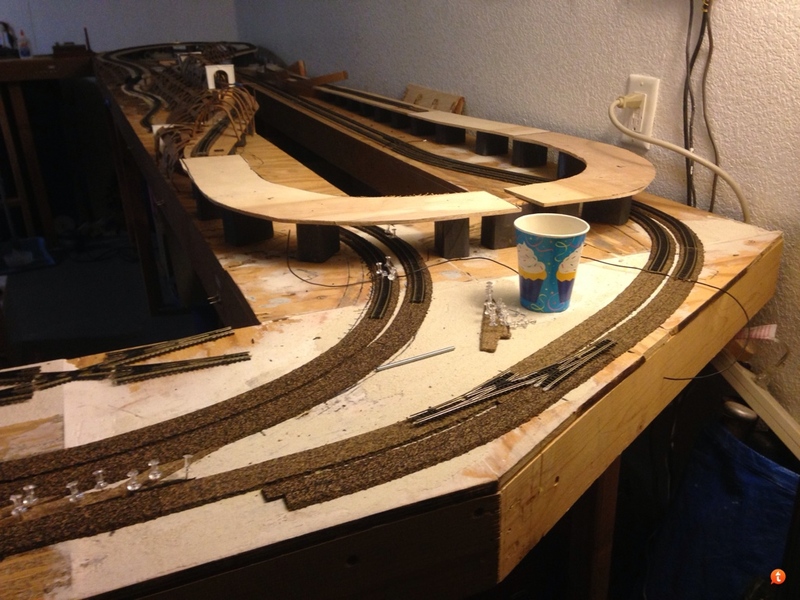 Wasn't happy with the curves in two wrap around tracks passing under the mtns and one of the turns in the mtns itself. I'll post some before and after pics. 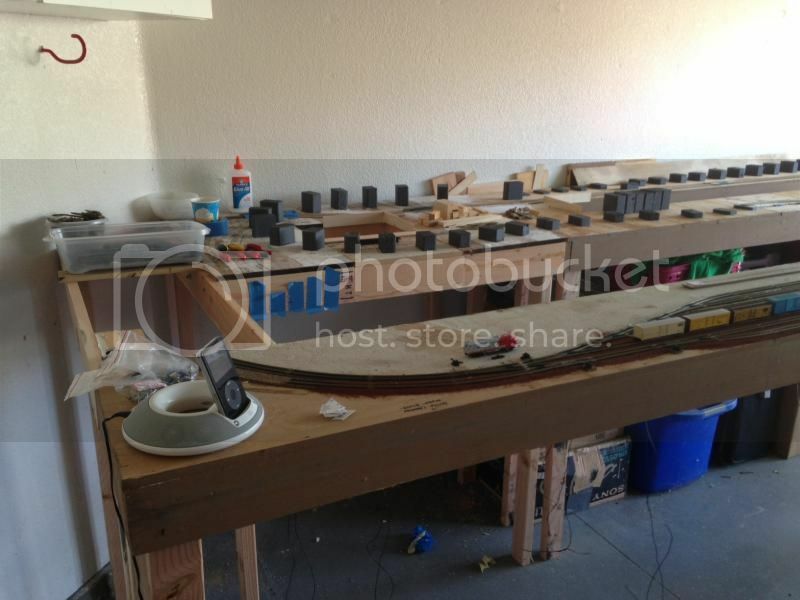 So here is the end I started remodeling. 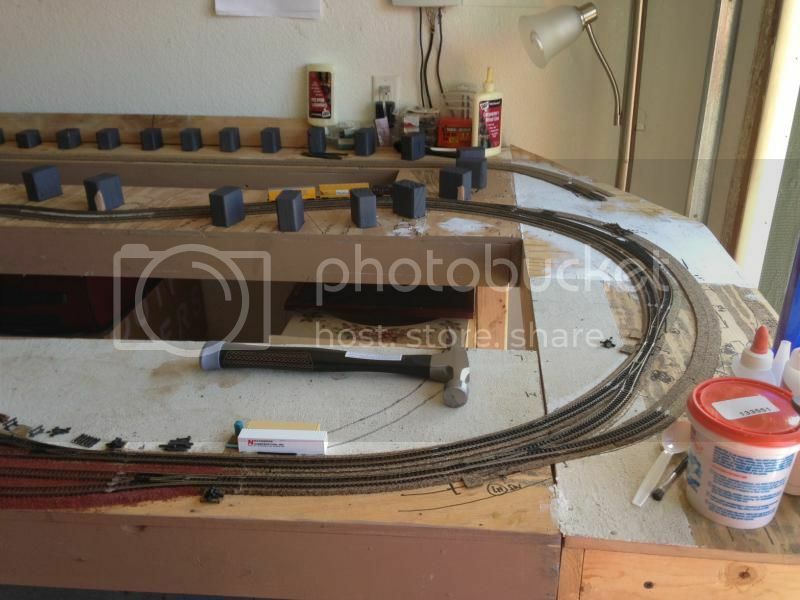 I didn't like the radius of the half circle in the mountains, and the sharp turn of the two twin tracks running under the mountains were both causing some derailments on longer cars such as intermodal cars and the long tank cars/reefer cars. 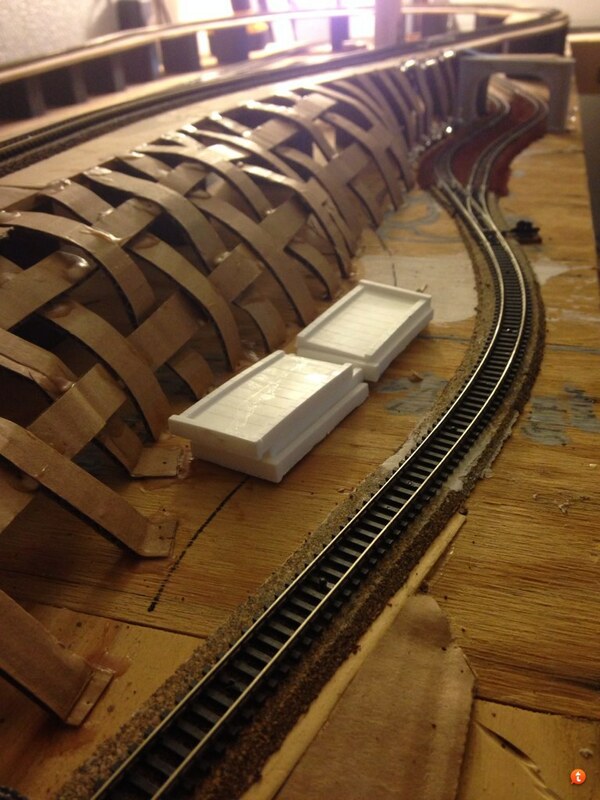 That's all for tonight, tomorrow I hope to get the rest of the roadbed down and start laying track. 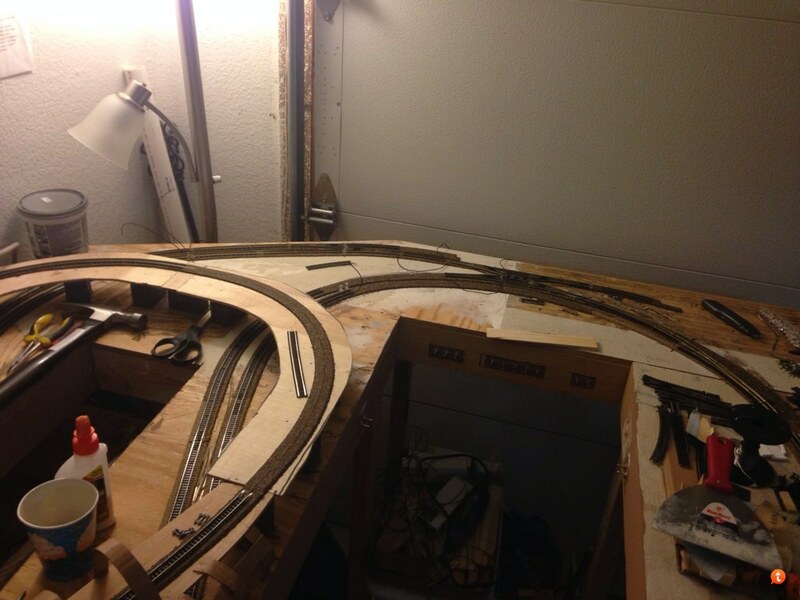 I've also got some curved turnouts on the way that should help this end out considerably. 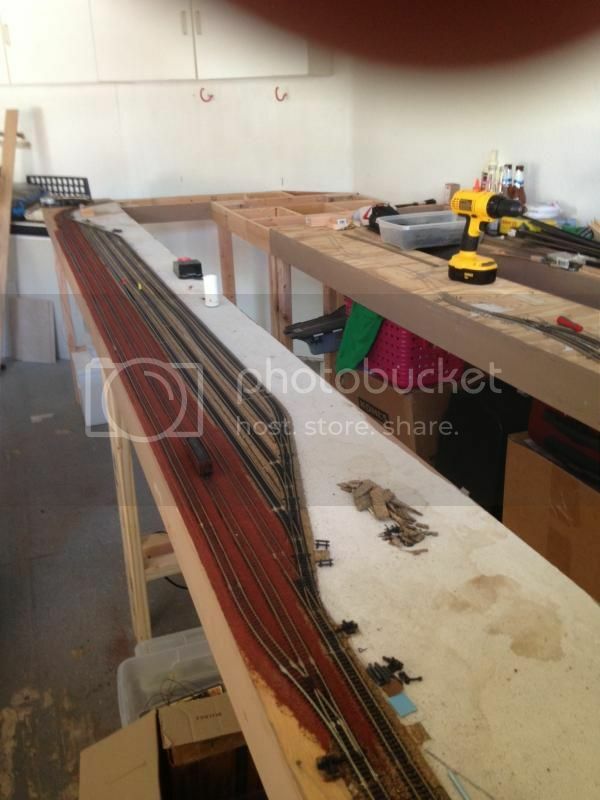 Great looking layout Steve. I LOVE the ground throws for your switches. 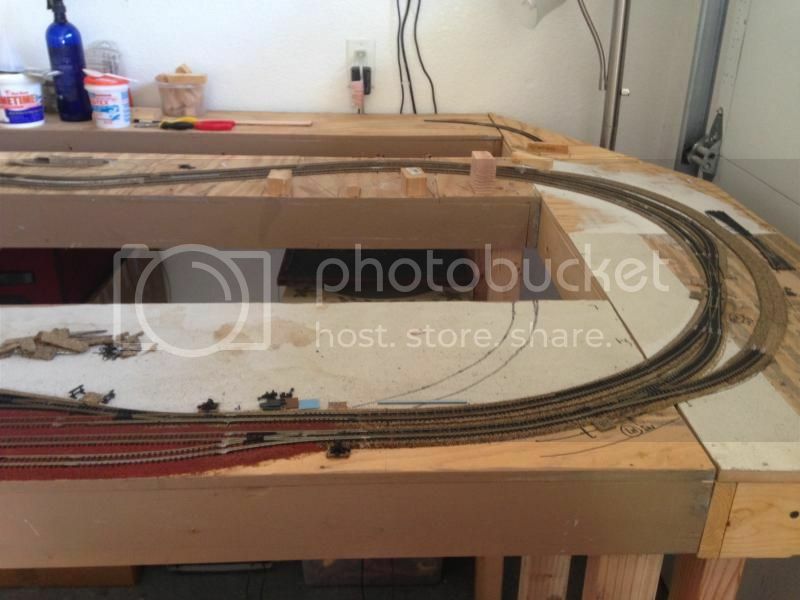 I am drawing up several plans for my indoor railroad and I intend to use no remote switches for ease of wiring and dependability. 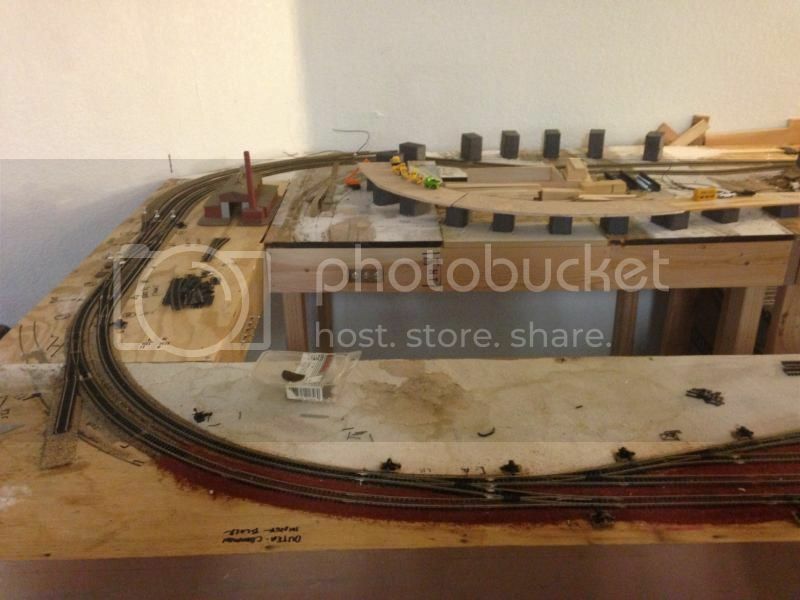 Plus, your through yard at the front is very well set up. 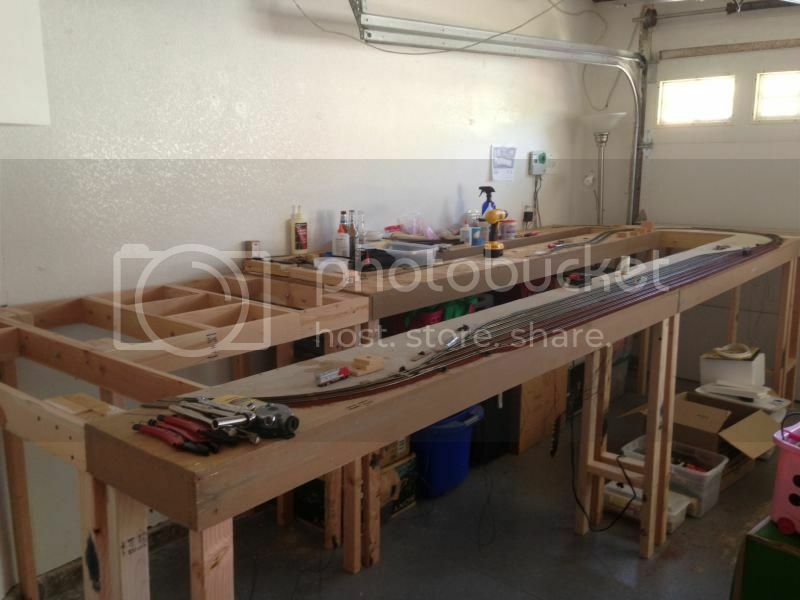 I am going to incorporate the plan and add an equal size ladder in both directions. Way cool and keep up the post with your progress. Thanks for sharing!! Got some work done this weekend but not as much as I had hoped. 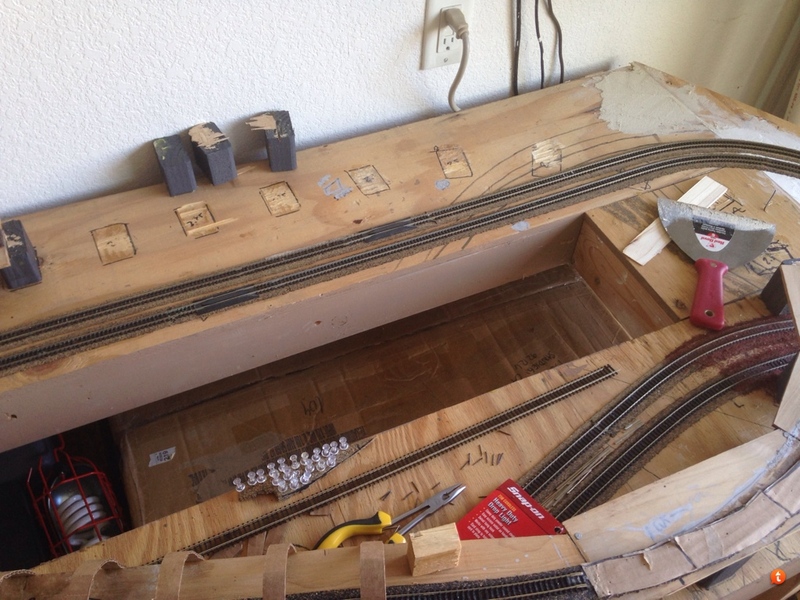 The next few days I should be able to finish putting in the track and rewiring this end as I go, I've also got to lay the track on the elevated part of the mountains. 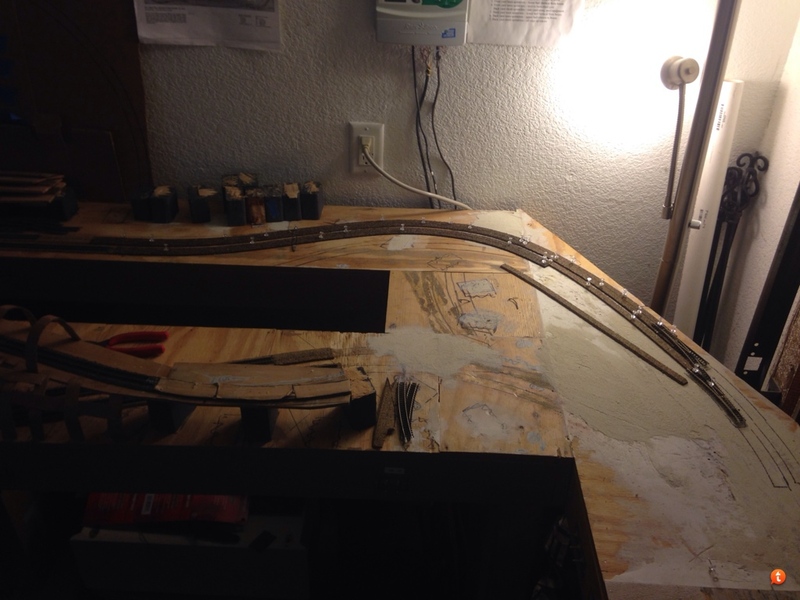 It's a lot of work but the better curves should work much better for the trains rather those two sharp curves I had before. 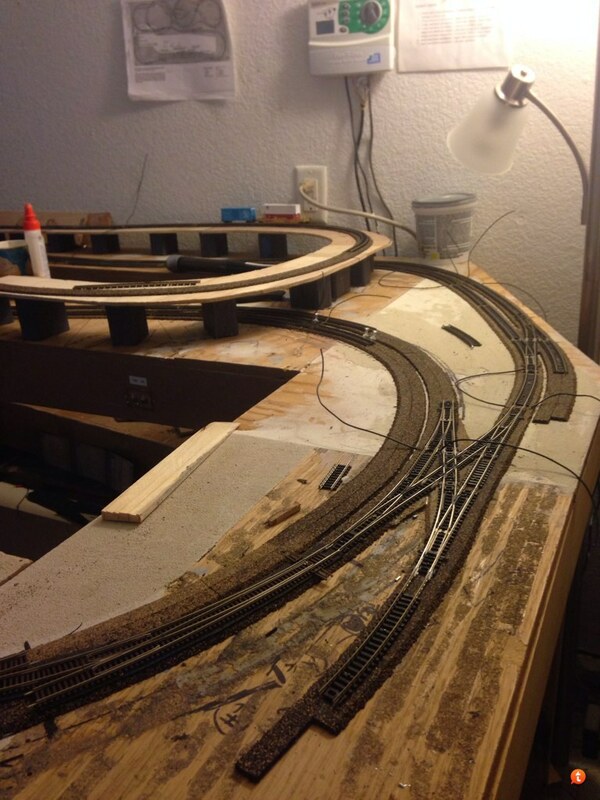 Started working the curved turnouts into the layout and joining some code 55 and 80 since only one has the curved turnouts. Thanks again "Nscaler" for posting the link on joining them. 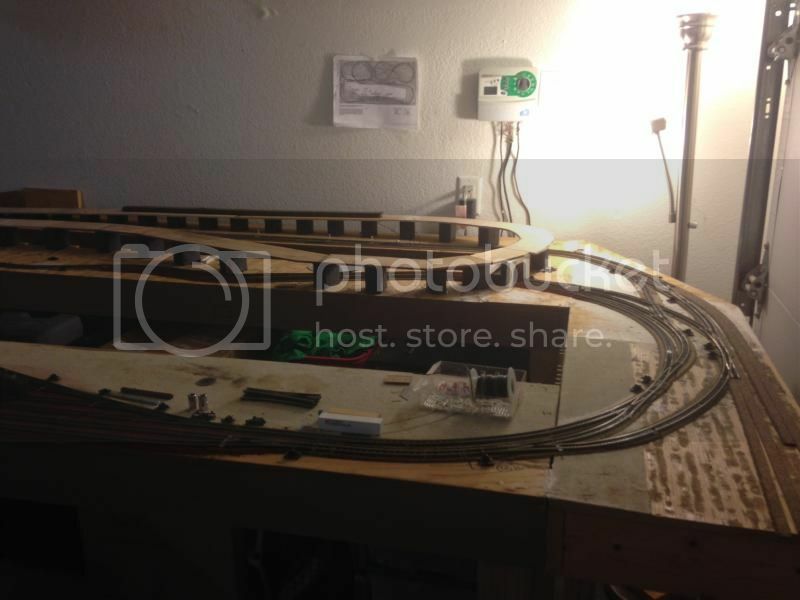 I personally added some material under the curved turnouts since they sit higher once soldered together. 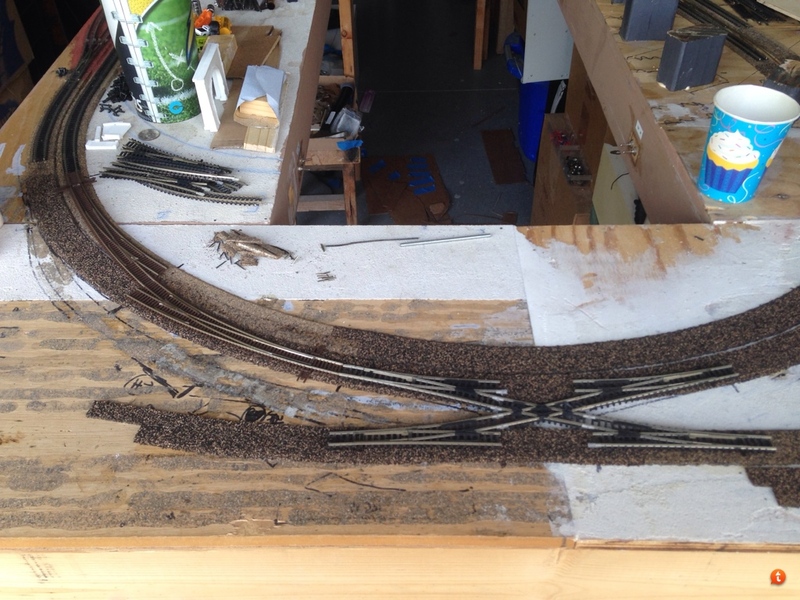 Overview of the switches and interchange of the remodeled end. 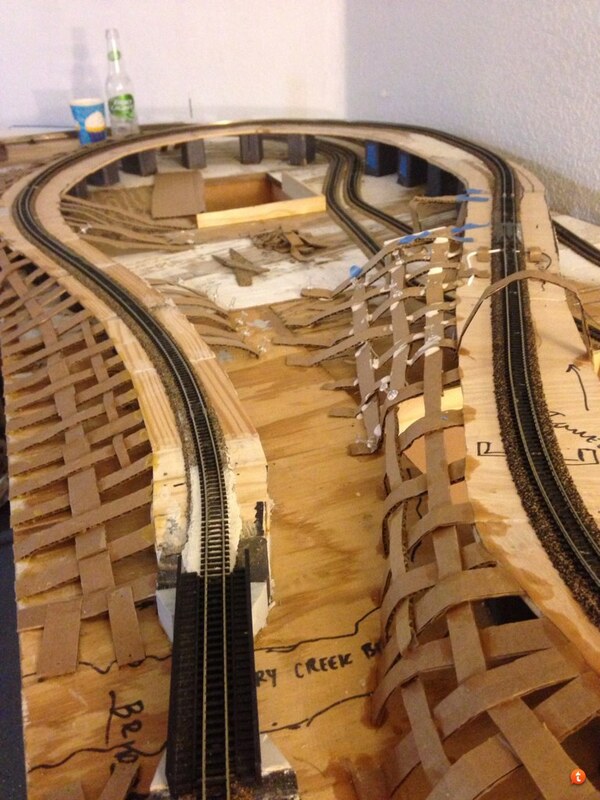 Just need to add in a few more sections of track and rewire the different blocks. Sorry for the crummy iphone pics, lighting isn't too good in the garage at night. 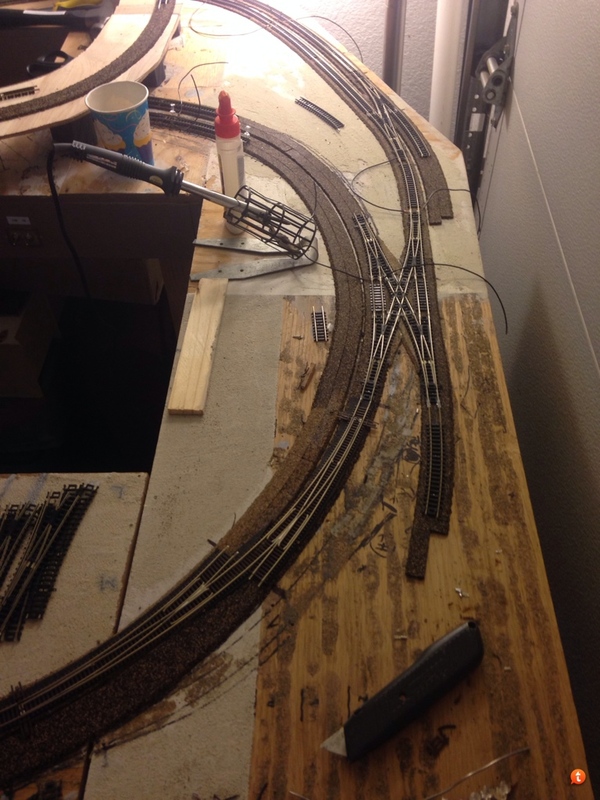 I'll take some in better lighting when I get this ends track finished. 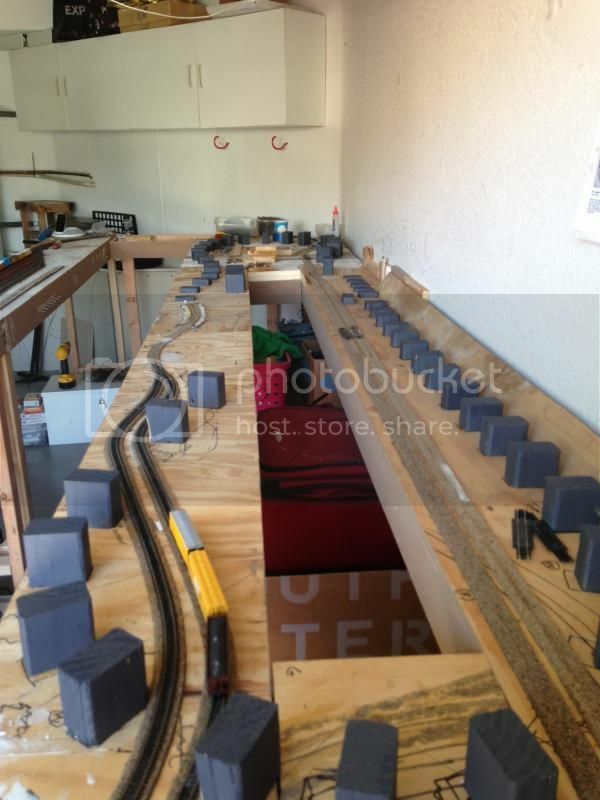 Great job, layout is looking awesome. Keep the pics coming. Thanks, it's got a long way to go still! 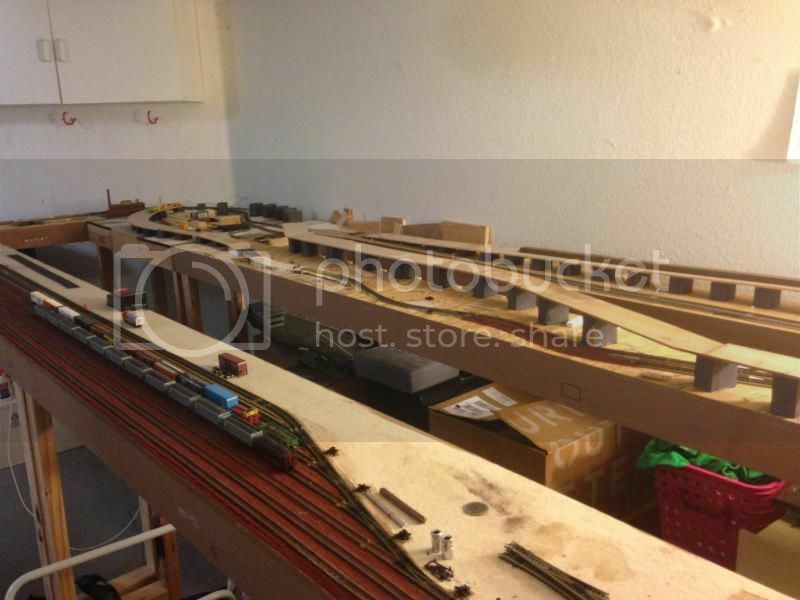 Hope to have that end operational again this weekend. WOW! You're not letting any grass grow under your feet! 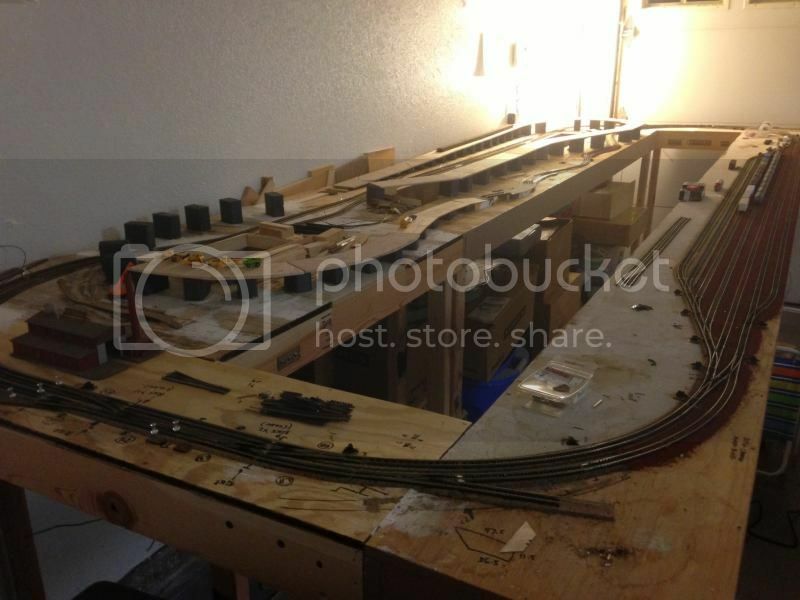 Things are looking good and really well put together. Really enjoy the photo progress reports. 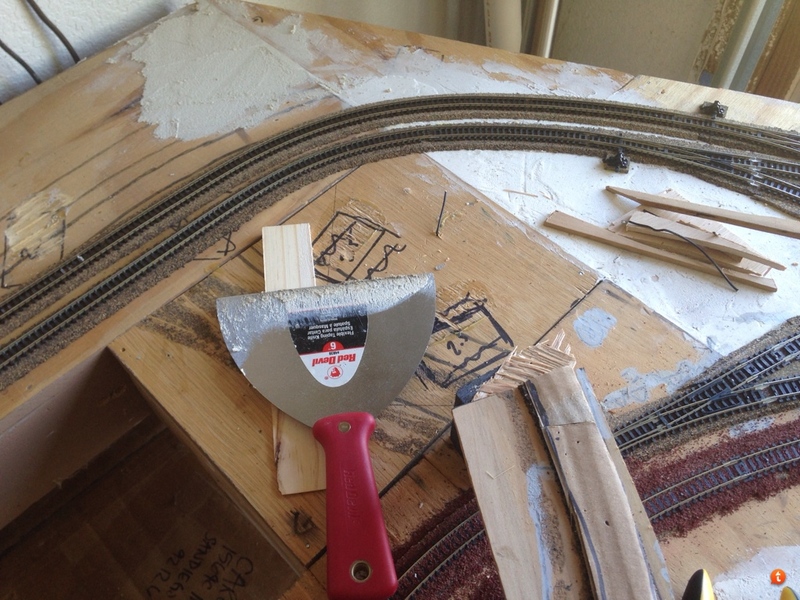 I am FINALLY near the end of the planning stage and am probably going to put paper plans to wood this coming autumn. 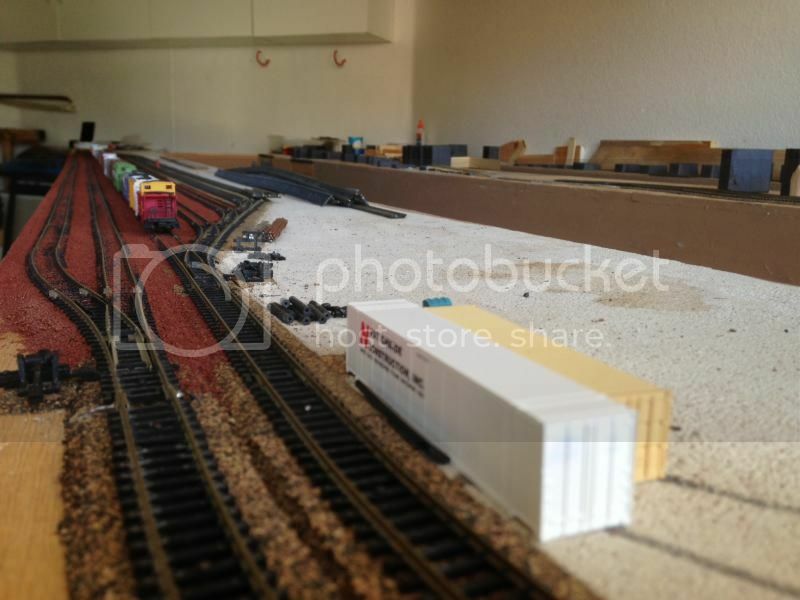 I must admit to really using some of your ideas in creating a good running layout with many interesting features. I tend to think in terms of plywood table tops but your open grid style has convinced me to go for a more scenic approach.